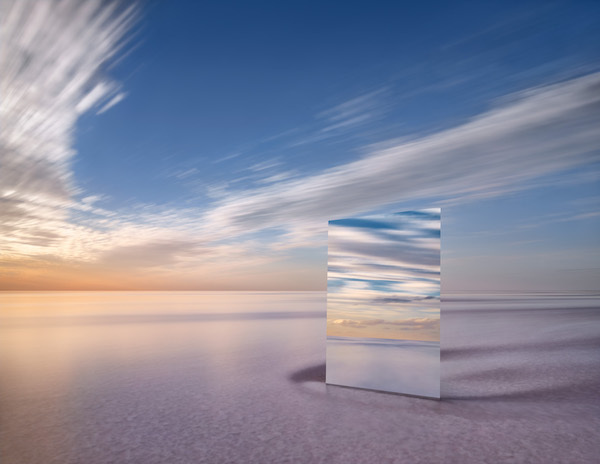 Murray Fredericks, Mirror 17, 2017. Digital pigment print, 120 x 155cm. Courtesy: the artist and ARC ONE Gallery, Melbourne. Melbourne’s ARC ONE pops up in Sydney with an exhibition of works by artist Murray Fredericks. Comprising two significant bodies of work, Vanity (2017) and Array (2018/9), WITNESS sees the artist intersect endless space through the ethereal reflective quality of mirrors. Rather than employing the mirror as a symbol of self-reflection, Fredericks redirects our gaze away from ourselves and into the immense environment. His translations of the landscape verge on otherworldly; reflections hover together as geometric forms, apertures or portals, offering a dual experience of looking both into another realm and out, as the lake’s glass-like surface mirrors an infinite space above. These works plunge the viewer into a mesmerising spatial gestalt as Fredericks dissolves the contours of the landscape into a limitless optical deception. Place is defined by boundless empty space. By removing his/our reflection from the picture entirely, we are not the projected centre of the world. Fredericks subtly questions the narcissistic qualities of the human condition in the age of the Anthropocene, wherein human activity has become the overriding force on climate and the natural world. He casts our self/image adrift, so that we might be consumed by the sensory phenomena of light, colour and space on a visceral level, engaging another stratum of consciousness that echoes the artist’s own experience of living in solitude on the lake.